Easy Baked Salmon – So… What Should We Make? This is a quick and versatile baked salmon recipe that you can take to work for lunch, or save for dinner. I’ve been buying boxed brown rice from President’s Choice that’s already half cooked, which really reduces the amount of time spent in the kitchen. I’ve accounted for this reduction in time in my guidelines below. Get your rice cooking according to package instructions. 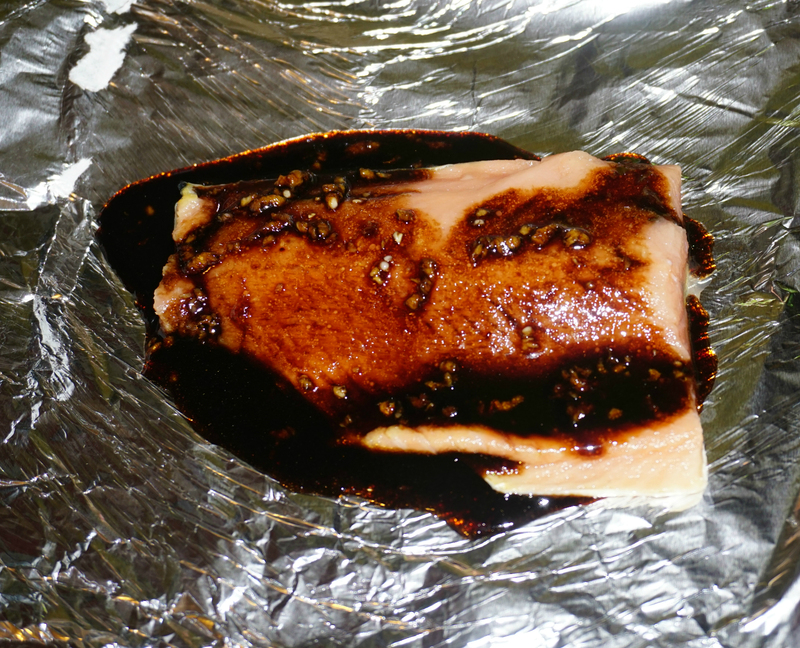 Preheat a toaster oven/oven to 375 degrees F.
Mix together the soy sauce/teriyaki marinade, balsamic vinegar/glaze, 1 tbsp of olive oil and minced garlic together. Lay down a sheet of aluminum foil and place the salmon on top. You should have enough foil to completely wrap the salmon up in. Pour the sauce over the salmon and fold the aluminum foil over to completely wrap up the salmon and the sauce. Poke a few small holes with a fork to allow some steam to escape. Place the packaged salmon directly on your oven rack, and allow to cook. It takes approximately 5 minutes for salmon that is 1/2 inch in thickness to cook, so use this as a guideline when cooking yours. Most salmon fillets are between 1/2 and 1 inch in thickness, so I always take the salmon out at around 8 minutes and leave it in the foil for a few extra minutes before removing so it continues to cook. While the salmon cooks, heat up 1 tbsp of olive oil in a frying pan. 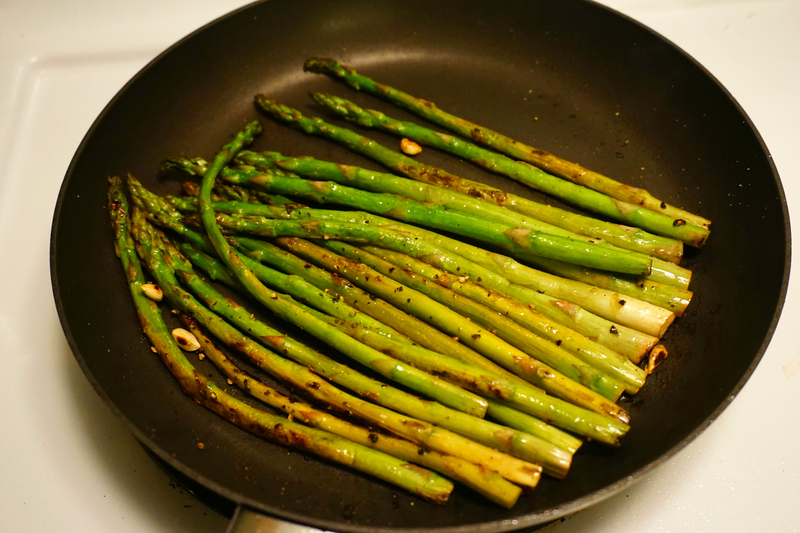 Once the oil heats up, throw in washed asparagus and let cook for 2 minutes. Squeeze 1/2 lemon over the asparagus, and add salt and pepper to taste. Allow to cook for another 2-3 minutes, depending on how soft you like yours. Take the salmon out of the foil. Season your rice to your liking (I like to add some kind of heat, like sriracha). 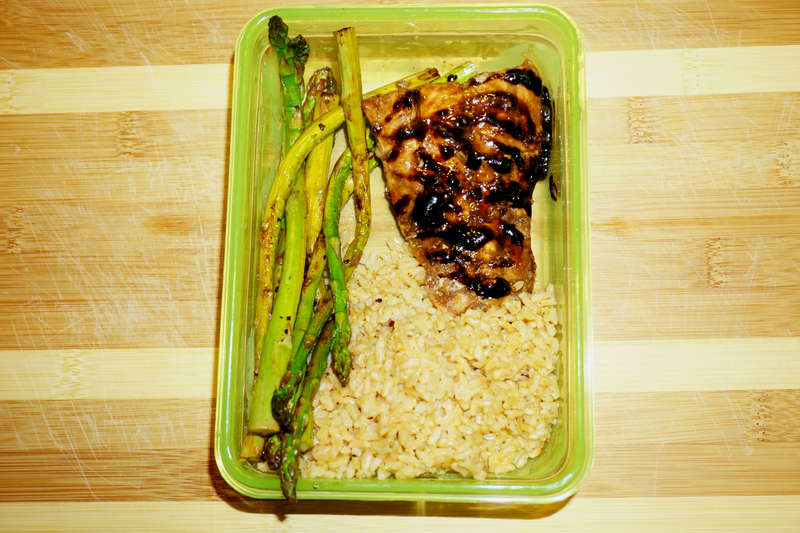 Put all of your elements (salmon, brown rice and asparagus) on a plate to enjoy immediately, or in a tupperware container to save for later. You’re done!